. . .and here's what I started with!! Beginning with a derelict ’31 Ford Tudor body that had long ago been put out to pasture amidst the yucca plants of Western Nebraska, William Wonder of Onawa, Iowa, with the help of a lot of friends and fellow members of the “CLASSICS” Car Club, has transformed this once forgotten family sedan into a real cruiser. . .with an attitude. 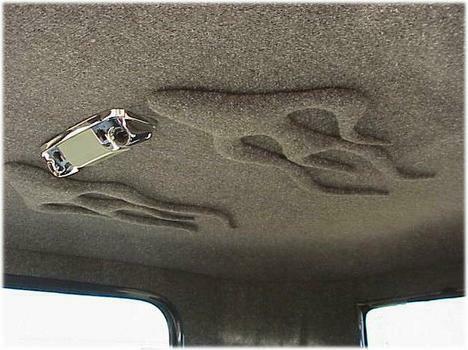 The car features no less than 30 body modifications, although many of them are subtle. The car has been chopped a full four-inches, with a smoothed and filled steel insert. Up front, a ’70 Ford moonroof has been tastefully molded-in, along with the sunvisor and front cowl. The windshield posts have been filled and smoothed and the windshield “set-in”. 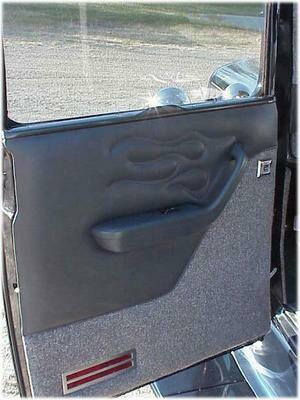 Those awkward-looking, over lapping Model A doors have been cut-down and “flush-fit”, with the back upper corners rounded to match the curvature of the window glass. The original drip rails have been removed and the body lines continued and tapered to the front. 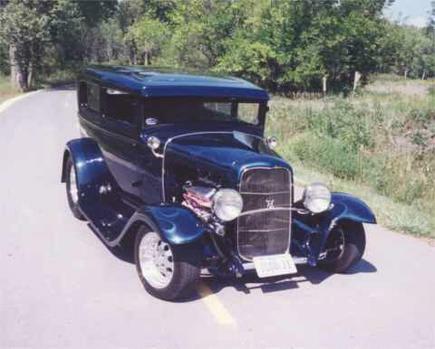 The familiar Model A rear body seams have been removed and the rear body has been “notched” to recess the four-inch wider-than-stock ‘glass rear fenders, which were chosen to be more in proportion with the wide rear rubber tucked under the car. 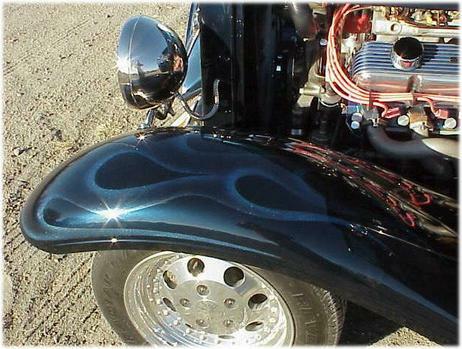 A custom steel rear pan was fabricated from an extra sunvisor to match the one in front. It has been narrowed and recessed for the license plate. Tail lamps have been frenched into the body above the rear pan and were originally the third brake lights from the decklid of a’76 Toronado. A steel, recessed Bitchin’ firewall and front floor section was installed along with Bitchin’ rear wheel tubs, that were actually widened an additional eight-inches and fitted to an owner-fabricated rear floor section. One-piece steel splash aprons and smooth steel runningboards flow into a set of ‘glass ’31 front fenders that have been modified for A-frame clearance. Rather than simply “box” the fenders around the upper A-frames, a pair of gracefully-executed, simulated air intake scoops were formed and faded back into the stock lines of the fender. 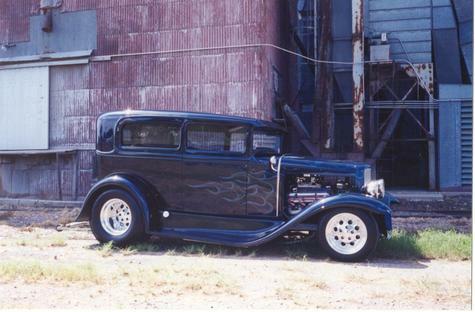 A “filled” ’32 grille shell is accented by a stainless grille insert and a three-inch dropped headlight bar. Original-style script headlamps house halogen bulbs and the repro cowl lights contain the turn signals/emergency flashers. A ‘glass, one-piece hood is hinged to open straight up, using Pinto/Mustang II hinges, and features custom-fabricated aluminum side extensions by Duane Miller of Onawa. 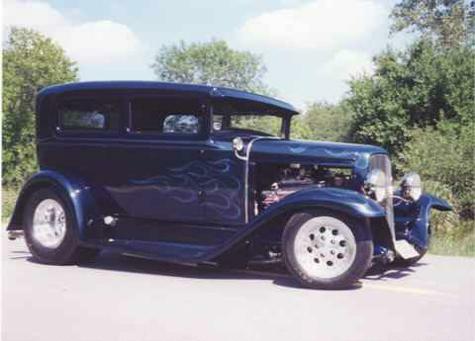 The top was chopped by the owner and Jim Beck of Onawa, while the remaining bodywork, custom touches and paint were handled in his garage by William and Guy Doyel of Magnolia, Iowa. 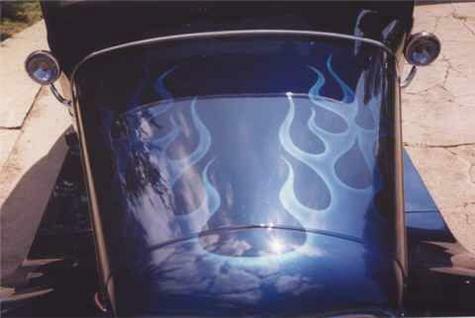 The car is finished in ’93 GM Black Sapphire Pearl Metallic (a real dark blue) and is accented by Blue Pearl “ghost” flames, dusted on the timps and edges with Sovereign Blue Metalflake for a sparkling effect. 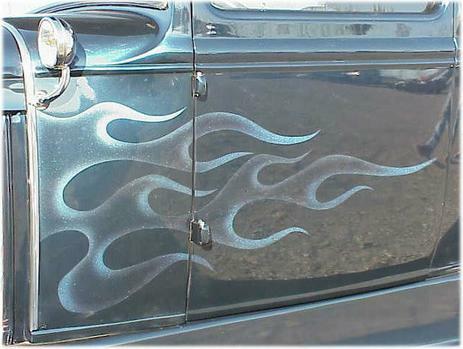 The flames were designed by the owner and laid on by Guy Doyel and Roger Hackett of Sioux City, Iowa. Everything has been covered with high-solids clear. They say that all good rods begin with a solid foundation. . .and one-third of this one is still genuine Ford issue. In fact, it had been removed from the old car years ago, with a section of another frame flipped upside down and welded on the rear to mount a buggy seat (for what reason is anyone’s guess). Regardless, it was straight and the aft half was scheduled to go anyway!! A pro street subframe kit was ordered from Total Performance in Connecticut. A ’69 Ford nine-inch rear end housing was narrowed to 36” before being chrome plated and fit with a set of 3.89:1 gears by Mark Renshaw of Tekamah, Nebraska. The kit included dual leaf springs, stainless shackles and spring clips, a tri-angulated sway bar and HD gas shocks. 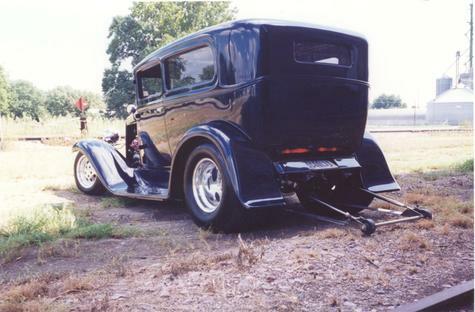 A set of chrome plated wheelie bars added to the car’s aggressive stance. 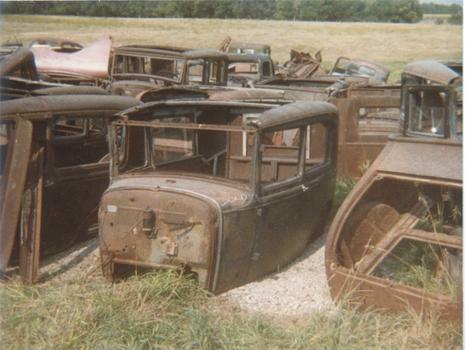 Up front, an ’80 Pinto surrendered everything, including the factory cross member, which has been molded to the original Model A frame by William and Charlie Meadows of Onawa. A-1 Racing provided all new upper and lower control arms and 5-bolt disc brake rotors. The front spindles have been ground smooth and the manual Pinto “rack” has been polished. Additional glitter comes from chromed lower control arms, chrome Heidt’s tubular strut arms and chromed backing plates on the rotors. HD gas shocks hold up the stock front springs that have been relieved of one-and-a-half coils for a low look and just the right amount of “rake”. Special steering linkage snakes its way back to a tilt wheel from a ’73 Vega. The rest of the original ’31 frame has been fully boxed, molded and smoothed with molded-in tubular engine and transmission cross member. Welding chores were handled by Rick Gries of BNR Racing in Onawa. 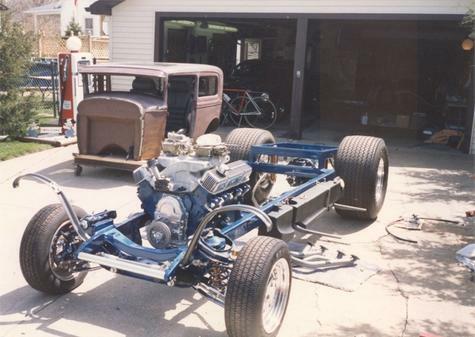 The frame was base/cleared in ’92 Ford Ultra Blue Pearl Metallic by Guy Doyel. 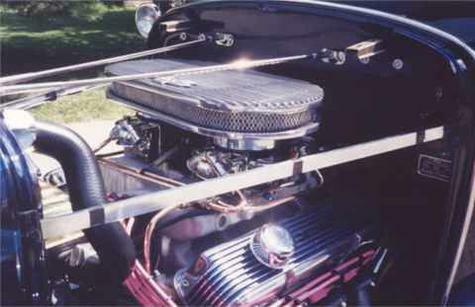 An owner-fabricated aluminum front spreader bar is fitted with an aluminum license plate bracket that lays the plate down similar to the one in back, while at the same time, force-feeding air to the dual 11” cooling fans behind the ’32 grille. 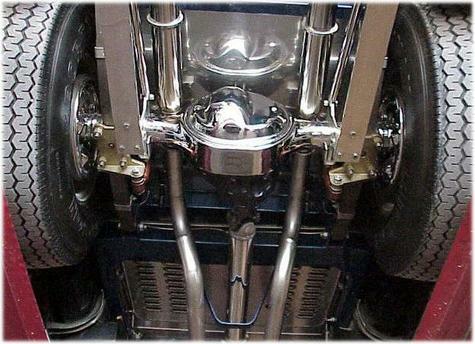 A pair of LTL saddle tanks were mounted to the frame along with a polished stainless, drop-out battery box. 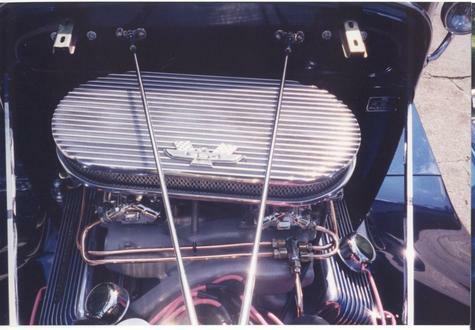 The entire underbody floor pan is covered by a Bitchin’ louvered polished aluminum belly pan kit that was modified for the pro street chassis. The engine of choice is a ’63 vintage Ford 390 big block, rated at 330 horsepower with 10.5:1 compression and quenched-chamber 406 cylinder heads. A TP144 hydraulic cam bumps the valves to .515” of lift at 233˚ duration via factory adjustable rocker shafts and triple valve springs. A clean, low-mileage original, the engine retains a standard bore, crank and pistons. Internal mods include a double roller chain and steel gear set, chrome moly HD oil pump drive, screw-in oil galley plugs and factory Ford windage trays both top and bottom. Engine building chores were handled by Mark Renshaw. Outside, the engine features a polished aluminum factory timing cover and polished billet Mallory Uni-Lite distributor, further accented by a chromed coil, chrome rear sump oil pan, chrome Chevy one-wire alternator with custom-built low-mount brackets, and a set of nostalgic, polished and finned aluminum Cal Custom valve covers with rare, ’78 GMC Street Sedan emblems. Topping all this is a somewhat rare, Edelbrock FX66 crossram intake with roller bearing and cable linkage. A pair of matched 600 c.f.m. Holleys with chromed center-pivot bowls feed fuel via a series of custom-bent, polished copper lines with owner-fabricated fuel log actually made from an 11/16” lug nut. Steve Shamburg of Tekamah, Nebraska worked his magic on the Holleys and bent all the lines. Dspite their radical appearance, the dual fours are quite docile on the street (until you stomp on it) and run well on 92 octane pump gas. . .although she really likes the 108 octane stuff!! 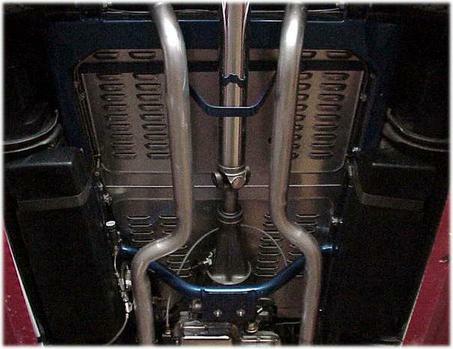 Exhaust gases are vented via a set of custom-built 1 7/8” Sanderson headers through a full 2 ¼” aluminized exhaust system by Don’s Exhaust in Onawa. 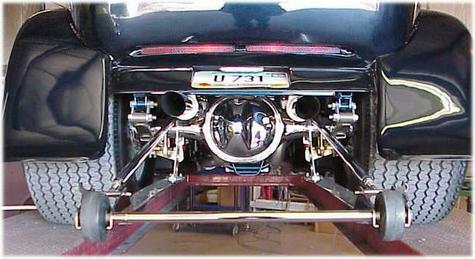 A pair of three-inch polished stainless mufflers exit beneath the rear license pan with an authorative rumble. A ’68 Ford C-6 automatic from K & S Transmission Services in Omaha, Nebraska features a performance shift kit, chrome pan and front cover. Shifting chores are handled by a Hurst Pro-Matic 2 shifter and power is transferred to the differential by way of an ’87 Corvette polished aluminum driveshaft that was shortened approximately five-inches by Stephen in Sioux City. Rolling stock is courtesy of polished Centerline “X”-Style wheels, 15 x 12” rear and 14 x 6” front, mounted on 31 x 16.50 x 15” Mickey Thompson and 185 x 14” SR60 Revengers respectively. 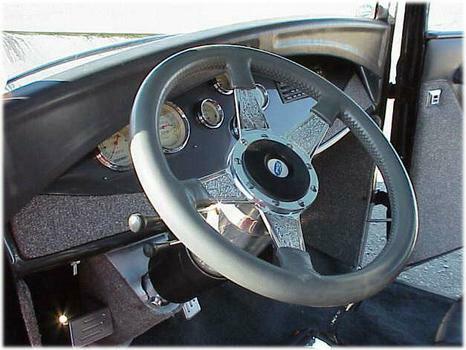 The inside of the cramped quarters of the now hammered Model A is lined with a combination of gray leather, gray tweed fabric and silver gray carpet by Chas Dillender of Oakland, Nebraska. 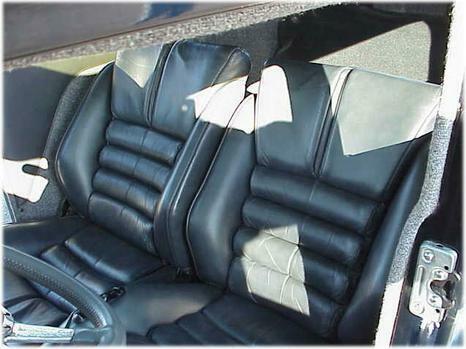 Leather seats are from an ’87 Dodge Shelby Daytona and feature 6-way power, tilt and lumbar controls. The original dash and a LeCarra Gunsmith XI “engraved” four-spoke wheel are also wrapped in gray leather. The original dash was cut out and the gas tank removed. The dash was then reinstalled at an angle, before being molded into place. A second upper dash rail was “flipped” and grafted to the lower section of the Model A dash for that “finished” look. 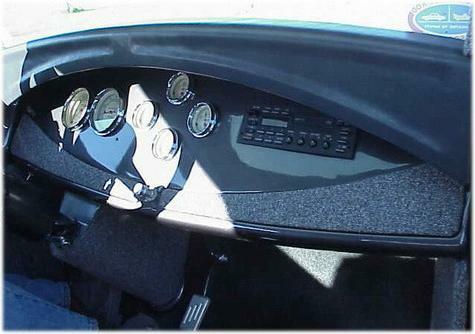 A full set of Vintage Series gauges were fitted and installed in the modified dash, along with a complete JBL stereo from a ’90 Thunderbird Super Coupe. The dash and interior moldings are all painted ’93 Lincoln Dark Charcoal Metallic. Specialty power windows, power remote door locks and purple neon underneath are all tied together with a wire loom from Ron Francis and some additional expertise from Rick Deen Electronics of Whiting, Iowa. 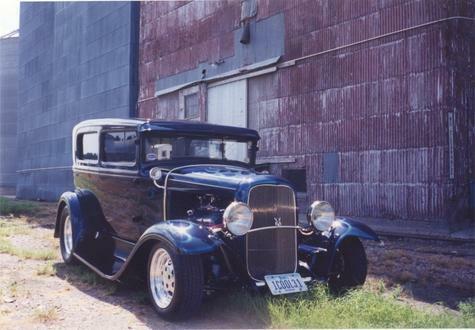 Dark gray smoke-tinted glass features “etched” bullet holes for that ‘30s gangster touch when the car is displayed with William’s Model 1927 Thompson. Now that the car’s gone from an idea on paper to the street, William says the sedan is very quick and drives like a dream, even though the rear ride is a little harsher than he had anticipated. . .In spite of this, he feels that he achieved the look he was going for, saying the ride is a small sacrifice considering the looks the car gets when he drives it on the streets of his hometown, which boasts the Widest Main Street in the U.S.A.!! Just goes to show what you can build at home, in your garage, with a little determination and a lot of help from your friends! !